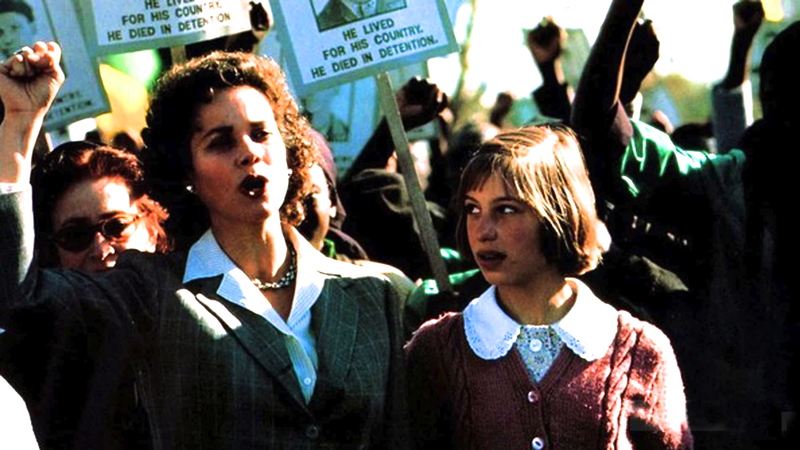 Molly (Jodhi May), a white teenage girl living in Johannesburg during the 1960s, finds her life turned upside down when her leftist parents become targets of the pro-apartheid South African government. Molly’s father, Gus (Jeroen Krabbé), is forced into exile, but her mother, Diana (Barbara Hershey), continues her activism. As her family’s reputation leaves her shunned by her fellow white peers, Molly grows closer to her mother and begins to understand the anti-apartheid cause. A World Apart was the directorial debut of the British cinematographer Chris Menges. Written by Shawn Slovo, it was based on the lives of her parents, anti-apartheid activists Ruth First and Joe Slovo. It was the first film at Cannes to win both Special Jury Prize and Best Actress award, which was split between Barbara Hershey, Johdi May, and Linda Mvusi.